A persuasive combination of Beethoven's music and a contemporary text inspired by the 1994 Rwandan genocide looks like being this year's best kept music secret. Last autumn I added a comment to my post Also sprach the Composer noting that Paul Griffiths had been working on a project that combined the story of the Rwandan tragedy with a composite score drawn from Beethoven's music. Last month a Sony BMG double CD slipped onto the amazon.co.uk website. 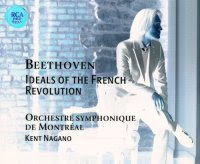 The title of the CD was Beethoven - Ideals of the French Revolution and the moody study of conductor Kent Nagano on the cover can be seen above. The track listings are only a little more informative than the title - CD1: The General, for orchestra with soprano, choir, and narrator. Music by Ludwig van Beethoven. Text by Paul Griffiths. CD2: Ludwig van Beethoven. Symphony No.5 Op. 67, Egmont Op. 84 (excerpts) and Opferlied, Op. 121B. OP - the starting point for The General was Beethoven's incidental music to Goethe's Egmont. Why did you discard Goethe and create a new drama around Beethoven's music? PG - The idea came from Kent Nagano, who wanted some new, specifically Canadian works for his first season as director of a Canadian orchestra: the Orchestre Symphonique de Montréal. He was very enthusiastic about the Egmont music but less so about the way it's usually presented in concert, with an actor as Egmont delivering a sketch of the Goethe play. Looking for a new story, and a specifically Canadian story, he asked people in Montréal to suggest a Canadian hero around whom the music could be resituated, and the name he kept hearing was that of Roméo Dallaire, who was head of the U.N. peacekeeping mission in Rwanda in 1994. General Dallaire had information that the civil war was about to turn into something far more bloody, and he asked U.N. headquarters in New York for the personnel and the means to intervene. These he was refused. He had to watch powerless as 800,000 people were slaughtered on the streets and in the villages. Nagano phoned me in April 2005 to ask if I would write something about the Dallaire-Rwanda story to go with the Egmont score. I was doubtful, as anyone would be. Apart from anything else, Beethoven’s Egmont music is strongly affirmative—human feelings and the rhythm of history are joined together in the march towards freedom—whereas the Rwanda story easily conveys an opposite message. I asked Nagano if I could think about the idea for two weeks before committing myself, and during that time I read Dallaire’s memoir Shake Hands with the Devil as well as other books on the Rwandan genocide, and I listened over and over again to a recording of the Egmont score. Eventually I found what I thought would be the key, which was the first word the narrator, in the role of The General, would say. Then I agreed to go ahead. OP - How much did you base your text Shake Hands with the Devil? PG - I also drew on two books by Jean Hatzfeld of interviews with people involved in the genocide, as fugitives or perpetrators, and other sources, in print and online. The only image I took directly from Dallaire was that of him driving to the beach, back in Canada, and seeing felled trees piled up by the side of the road. Of course, Dallaire is The General. He's the hero the piece had to have, because of the character of Beethoven's music - but a hero of a peculiarly modern sort. His situation raises fundamental questions about the world, questions the piece reflects by ending in a series of questions from the narrator, the soprano, and the chorus. As a combination of music and text, The General asks a question as well: whether Beethoven’s music (positive, optimistic, belonging to the world of two centuries ago) can work with the Dallaire-Rwanda story. Of course, I feel it can. But the question remains open for anyone encountering the piece on record or in the concert hall. OP - The General is built around the Egmont music. But it uses other music by Beethoven. For the concluding section you use his Opferlied Op. 121b but add new words. Why did you use music from other Beethoven scores, and why did you feel the need to replace the original text of the Opferlied? PG - I introduced other pieces by Beethoven for four reasons. First, the piece needed more slow music. Second, I was fascinated by the possibilities of melodrama, where the speaking voice responds to and is answered by orchestral gestures, as in accompanied recitative. The Egmont score includes one such section, and I was very glad to find another, in the music for König Stephan. Third, I thought I should try to ‘rescue’ as much as I could from Beethoven’s theatre music (leaving aside a lot of boisterous choruses and brash marches). Finally, the piece had to have a finale, and it couldn’t be the ‘Victory Symphony’, reprising the last exuberant section of the overture, that ends the Egmont score. I wanted something more in the nature of a hymn, and the Opferlied was exactly that—it even reintroduced the soprano who has to be there to sing the two Egmont songs. The text was completely wrong, about a young man dedicating himself to art. But that could be changed. OP - your text makes the story anonymous, neither Roméo Dallaire nor Rwanda are mentioned. Why is this? PG - There were many reasons not to refer directly to Dallaire or Rwanda. Probably the most important was a wish to remove the story from the aura of T.V. news. Of course, Dallaire and Rwanda will be in the minds of people listening, but if you talk about some person or place without explicitly mentioning the name, the effect can be so much stronger. OP - The General is a profound commentary on one of the greatest humanitarian disasters of recent times. Yet the graphics for the CD do not communicate the humanitarian theme at all. Is that to do with the decision to make the text anonymous? PG - My biggest concern over the visual presentation of the recording was not to have a photographic image from Rwanda in 1994 on the cover. But in fact I was not consulted. OP - How did the recording come to be made - and with Maximilian Schell as narrator? PG - It was Nagano who found financial backing for the recording, and who encouraged Schell to take part; the two had worked together on other things. I should add that Nagano also persuaded the Bavarian State Opera to give the European premiere, in January this year. That meant convincing a major and highly traditional German institution to perform the single Beethoven-Goethe conjunction with the Goethe part replaced by somebody from Wales. OP - in 1991 you re-envisaged Mozart to create The Jewel Box from his discarded music. Now you have re-envisaged Beethoven. Is re-envisaging a legitimate art form, and have you a third project in mind to complete the hat-trick? PG - There’s nothing new in this. It was common in the eighteenth century for numbers out of various operas to be stitched together to make what was called a pasticcio. And there are many examples of people putting new words to existing music: Bach did it often. The point of The Jewel Box is to restore life in the theatre to music that was written for the theatre and is difficult to present in the concert hall. When Mozart wrote a concert aria, he prefaced it with a recitative that would set up the dramatic situation. The arias he wrote as insert pieces, to go in operas by other composers, don’t have this, so that you’re suddenly plunged into emotions with no causes. Also, on the practical level, it’s very hard to programme a trio that needs three fine Mozart singers and lasts all of two minutes. (There is such a piece in the unfinished opera Lo sposo deluso, and in The Jewel Box it effects a crucial dramatic transformation: two ‘dead’ characters come back to life). The Jewel Box I did just because I could see the possibility, and then Opera North took it on. The General, on the other hand, was commissioned, though I suppose the way of working wasn’t so different—a matter of putting together all the pieces, and getting from one to the next by way of spoken text. I’ve also done a Purcell piece, Aeneas in Hell, to go before Dido and Aeneas, using rarely performed music from some of his many theatre scores and creating a text out of Dryden. And there are other projects that still need some work: Mozart’s Zaide, Debussy’s Sébastien. The first requirement in every case was to listen to the cues and clues the music provides. In The General, Beethoven's music had to condition the character of the text and - especially in the melodramas - the detail of its construction. Also, I wanted to make it seem - and omitting the specifics of names and places may have helped here - that the two centuries between the score and the story were becoming elided, that this music was written for this narrative. I've mentioned the disparities, but there were also congruences. For example, military music hasn't changed too much in the two centuries since Egmont, so that when the General talks about his troops being withdrawn, the march we hear doesn't sound out of place (or out of time). OP - the CD of The General is available now. What are the plans for further concert performances? PG - The U.S. première is scheduled for May, with two performances by the La Jolla Symphony under Steven Schick, better known as an outstanding percussionist. I’ve suggested it to a handful of orchestras and concert halls in Britain, so far without any response. But then, in this world, who knows? That is the background to The General straight from Paul Griffiths. But the story still has a few more twists. I mentioned that this admirable double CD is available from amazon.co.uk. But that is the only place in the UK you can buy it. After much digging I found that retail release is provisionally scheduled for June in the UK. Sony BMG's explanation for the Amazon stock is that it was imported by the online seller from Analekta in Canada. Which gives Amazon a clear six months to take sales from other retailers. Strange that RIAA stalwart Sony will happily be party to prosecuting youngsters who use file-sharing services, but choose not to stop Amazon undermining more service-oriented retailers. Marketing the single CD length The General as part of a 2 CD set that includes Beethoven's Fifth Symphony, a work which everyone already has several versions of, is also puzzling. The packaging keeps the contemporary text and its Rwandan origins completely secret. There are two different releases of the CDs; the generally available Canadian version from Analekta comes without texts, and the to-be-released RCA version comes with texts. Which, as the texts are the raison d'être of the project, is somewhat incomprehensible. If one work cries out for an audio sample it is The General. But you will not find one on the Sony website; although you will find one (with Sony's permission) at the head of this article. The only reference I could find to The General on the Sony BMG website fails to mention that the music is by Beethoven, yet alone the text by Paul Griffiths. 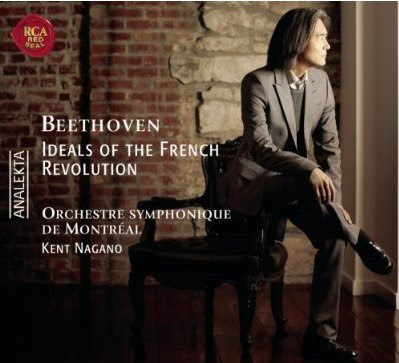 No wonder Kent Nagano looks so thoughtful on the cover. It is sad that part of this article has had to be devoted to the foibles of a major record label, particularly as Sony BMG had the vision to make the recording in the first place. But this new release should be receiving better treatment. I listened to The General many times during the writing of this article; each time I heard it I became more convinced that this re-envisaging has created a unique and powerful new work. A quite outstanding performance of Beethoven's music by Kent Nagano and L'Orchestre Symphonique de Montréal is coupled with a sensitive text by Paul Griffiths that addresses contemporary humanitarian concerns. The General deserves to reach a very wide audience. It would be a crying shame if Sony's muddle-headed marketing prevented that from happening. * Kent Nagano is no stranger to re-envisaging. In 2000 in Berlin he programmed an Ockeghem mass with a Mahler symphony. I mean, considering the incredible talent they have on this project - how could they be so sloppy? If the absence of the text can be deeply regreted, Analekta nonetheless provide freely both the booklet and mot of all the possibility to listen to the whole work on their website. Actually you can stream their whole catalogue for free (which makes for a much better preview than the usual 30s).